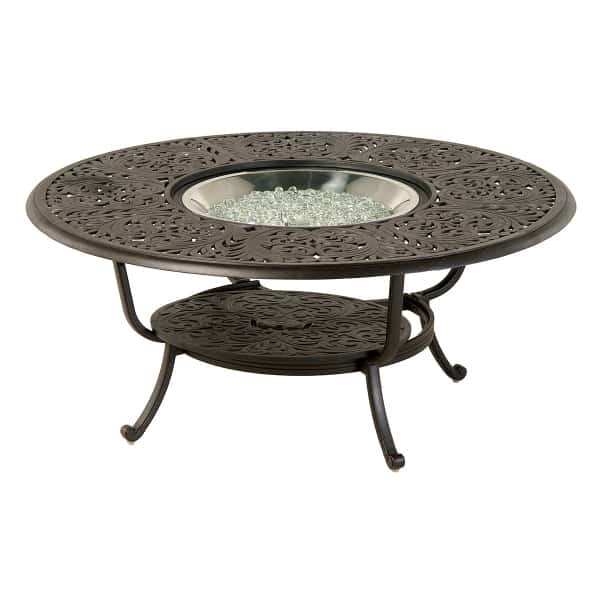 The Tuscany Gas Fire Pit by Hanamint has the allure of a Tuscan villa, with its old world ornamentation and appeal. The design may look intricate and delicate, but it is rendered in all weather aluminum and protected by Hanamint’s own 8-step powder-coat finishing process. This makes it ideal for any outdoor area and ensures that the Tuscany Gas Fire Pit will give you years of enjoyment. Hanamint’s Crystal Burner lights with a simple push button igniter, making it especially easy for you to get the fire blazing and you will appreciate the 60,000 BTUs of power. Flames will dance through the layers of “crystal” glass beads, providing you and your guests with a delightfully warming ambiance. Don’t need a fire on a hot summer night? The Crystal Burner can easily be switched out for Hanamint’s optional Stainless Steel Ice Bucket. Perfect for conversation in any weather, the Tuscany Gas Fire Pit can be combined with the coordinating Grand Tuscany Deep Seating Collection for an ideal entertaining area. Or use it as a stand-alone piece to complement any patio furniture.